A United Launch Alliance Delta IV rocket blasts off from Space Launch Complex-37 on Oct. 4, 2012, at 8:10 a.m. EDT with the U.S. Air Force’s Global Positioning System (GPS) IIF-3 satellite. 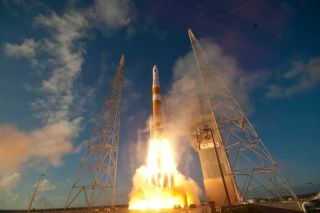 CAPE CANAVERAL, Fla. — A United Launch Alliance (ULA) Delta 4 rocket successfully launched the third in the U.S. Air Force’s GPS 2F series of navigation, positioning and timing satellites Oct. 4 from Cape Canaveral Air Force Station here. The launch took place at 8:10 a.m. local time from Space Launch Complex 37, according to Denver-based ULA, a Lockheed Martin-Boeing joint venture. GPS 2F-3 was placed into a roughly 17,600-kilometer orbit, where it will undergo a test and checkout period lasting for several weeks before replacing an older satellite in the constellation. Boeing Space and Intelligence Systems of Seal Beach, Calif., is under contract to build 12 GPS 2F satellites, which provide more robust and jam-resistant signals than earlier-generation GPS satellites. The newer satellites also provide a third civil signal known as L5 that will be used for commercial aviation as well as search and rescue operations. The GPS 2F satellites have 12-year design lives and will last longer than previous-generation spacecraft, according to the Air Force.